For over 45 years, Wilderness travel trailers have been synonymous with thoughts of adventurous family camping. 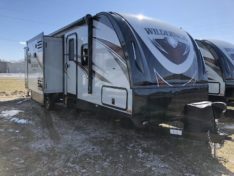 The Heartland Wilderness is a full featured Travel Trailer in a smaller, lighter RV package. You will appreciate the openness of the Wilderness layouts featuring a curvilinear ceiling measuring in at 7 feet. The fully light weight laminated construction technique maximizes insulating R-value and provides a quieter interior space. 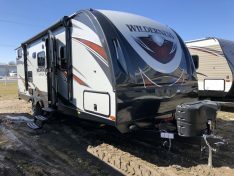 Also included in every Heartland Wilderness Travel Trailer is Heartland RV’s dedication to customer satisfaction using the latest in engineering prowess. Wilderness gives you room for the whole family to relax, dine, or entertain. 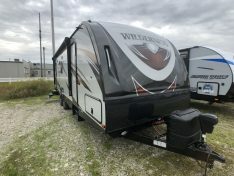 New for the 2019 Wilderness Travel Trailers is the 2500RL! The Wilderness has a 6 sided aluminum cage, 2in block foam insulation & a fully enclosed and heated underbelly. MONDAY - FRIDAY 9 a.m. to 5 p.m.
SATURDAY HOURS 9 a.m. to 1 p.m.